Simply a thrilling suggestion not to be missed. The Vasari Corridor is going to be open up to April the 27th, 2012, three times a week at a very low price, 10,50 € per person (Tuesdays and Thursdays 9-11,30am; Wednesdays and Fridays 2- 4,30pm.). An intriguing opportunity to get into a very special art collection and at the same time to experience the sightseeing of Florence core from above. It is like getting inside a mysterious site, unknown to the ordinary tourist because generally inaccessible. 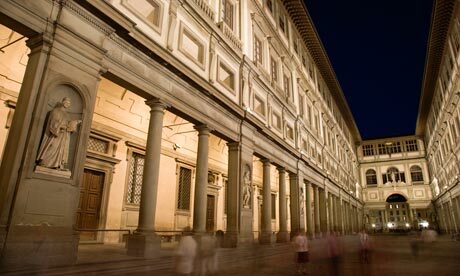 An anonymous entrance on the first floor of the Uffizi Gallery unexpectedly leads you into a quiet and silent world. A voyage back into Florence history, just on the steps of the Medicis, along the passageway linking the Uffizi Gallery, seat of the political power, to Pitti Palace, the residential site of Cosimo the first. It is quite impressive just walking and peeping through the round windows down to Ponte Vecchio or Santa Trinita Bridge, from an isolated and unnoticed position. The need of the ruler’s moving freely and safely was actually basic in the plan of the Corridor, Cosimo was in fact mindful of the Pazzi Conspiracy which Lorenzo, the future Magnificent, had succeeded in escaping from. Moreover in the 16th century the Medicis were no longer kings without a crown. They were by then gran-dukes, supposed to get more princely attitudes, including as well a deliberate detachment from ordinary people. The Corridor was planned by Giorgio Vasari, a multi-faceted personality capable of being simultaneously an architect, a sophisticated painter and an art historian. The wedding, on December the 16th 1565, between Cosimo’s son, Francesco with Joanna of Austria was the right occasion to upgrade the town. The speedy accomplishment, just 5 months’ works, implied some radical changes. The butcher shops of the Ponte Vecchio had to be compulsorily replaced by jewelry shops, still there nowadays, fitter for a no longer bourgeois dynasty which had already stepped with Cosimo’s marriage into the noblest Spanish dynasty. According to Vasari’s plan several medieval towers had to be razed and consequently the owners had, willy-nilly, to consent. 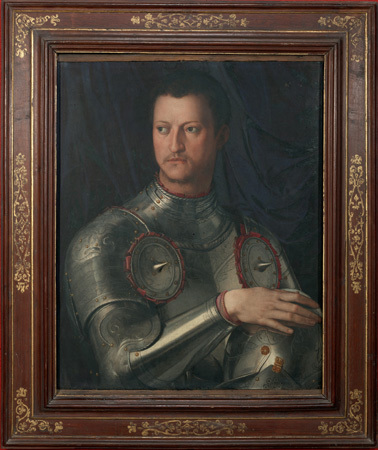 The Mannelli family proudly opposed the Medicis’ power but Cosimo’s political shrewdness solved the impasse to his own advantage, publicly appreciating the opposition with an apparently democratic benevolence. He was just enhancing his image of good ruler. Actually the Mannelli Tower there stands even today, at the end of Ponte Vecchio, at the junction between Via dei Bardi and Via Guicciardini. Vasari had to plan a change, a formal homage to democracy wanted by Cosimo. For the next two centuries the Corridor worked as passageway. Just a curiosity, the one kilometer route was covered by a small carriage. Under the last heir of the Medicis Anna Maria Luisa the Corridor lost its function of exclusive passageway. History has continued to privilege the Corridor leaving there its mark. 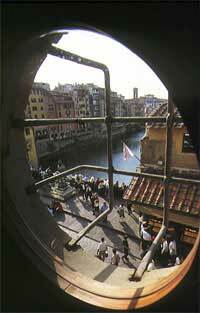 In1939 Benito Mussolini, stunned by the sight over the Arno River, ordered the Corridor’s small windows to be widened. Later Hitler, on his visit to Florence, was said to be so highly impressed by the Ponte Vecchio that he ordered to save it from destruction. 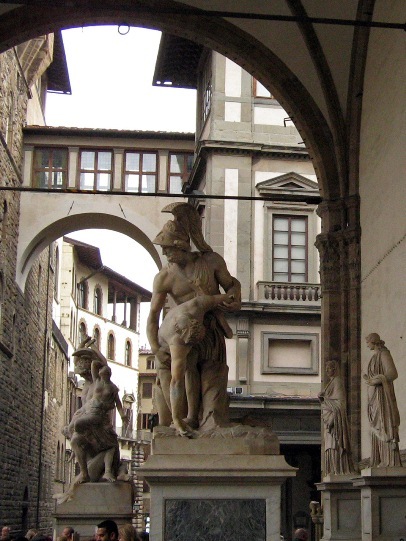 In 1993 the terroristic attack in via dei Georgofili partially damaged the Corridor and several works of art were destroyed during the explosion. 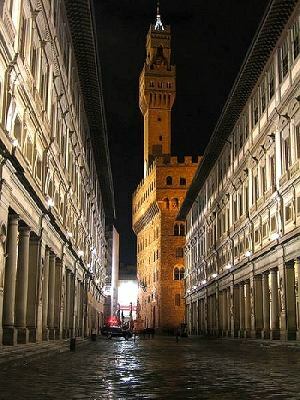 Nowadays, the visitor can enjoy a walk over Florence and admire, at the same time, the 16th and 17th century masterworks on display and the special and unique collection of self-portraits started by Cardinal Leopoldo dei Medici in the 17th century. A careful restoration will be ended in 2013 and the Corridor will become a public passageway to be enjoyed at any time by everyone eager to stroll over the town. Questa voce è stata pubblicata in Art and accommodations. Contrassegna il permalink.